This textbook introduces students to concepts, principles, methods, and procedures of Information Systems and teaches them how to exploit Information Systems in a technology-rich environment. 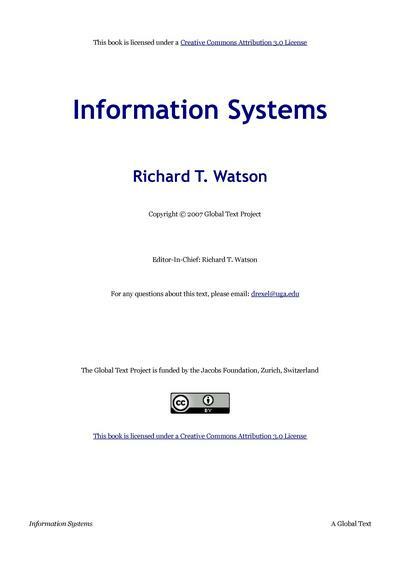 Richard T. Watson wrote:Introductory information systems textbooks often present the topic in somewhat of a vacuum. That is, they focus on information systems without really succeeding in showing how IS is integrated in organizations, how knowledge workers are supported, and how important IS is for an organization’s success. Many undergraduate students do not understand why they are required to take an IS course since they are not IS majors. Many also expect the introductory course to focus on personal productivity software. This textbook will teach students how to exploit IS in a technology-rich environment. It will emphasize why, no matter what their major, information and communications technologies (ICT) are, and increasingly will be, a critical element in their personal success and the success of their organizations. In other words, they need to be introduced to concepts, principles, methods, and procedures that will be valuable to them for years to come in thinking about existing organization systems, proposing new systems, and working with IS professionals in implementing new systems. Students need to understand systems and the systems concept, and they need to understand the role of ICT in enabling systems. Students will learn the characteristics of good systems (e.g., intuitive, likable, error-resistant, fast, flexible, and the like). Knowing the characteristics of good systems will permit students to demand well-designed systems and to suggest how existing systems should be changed. Students need to understand the affordances, directions, and limits of hardware, software, and networks in both personal and organizational dimensions. They also need to appreciate that, as technical capabilities change and new ones arise, more opportunities to apply ICT for efficiency, effectiveness, and innovation are afforded. They need to understand the process for developing and implementing new or improved systems and the activities of IS professionals in this process. 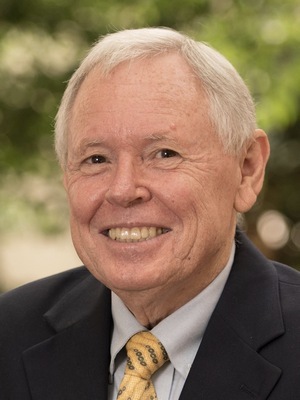 J. Rex Fuqua Distinguished Chair for Internet Strategy in the Department of Management Information Systems, Terry College of Business, at the University of Georgia.